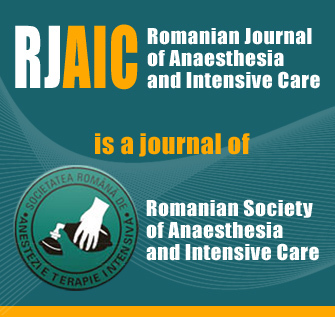 The Romanian Journal of Anaesthesia and Intensive Care (Jurnalul Român de Anestezie Terapie Intensivă) is a biannual, in English, with abstracts in English and Romanian, ranked CNCS B+ and indexed Embase and Scopus. This journal publishes papers reporting original clinical and experimental researches, reviews, case reports, editorials, guidelines, letters to Editor, book reviews as well as other materials considered adequate by the Editorial committee. Copyright for published manuscripts, in this journal, are retained by the Publisher and all authors must consent with this statement before manuscript is accepted for publication (see „Guidelines for authors”).